A vacation from a vacation – the stories that I'm telling. I haven’t worked since July 12th. That was my last day of work at Influitive, and then I hopped on a plane to Bangkok. It feels weird having not worked for so long, but also pretty great. Though Kevin is working in Phnom Penh, and I’ll begin working soon, I’m still not working yet, so it feels like I’m in vacation mode. This is why it felt even more weird when we decided to go vacation in the Philippines. It’s a genuine vacation for Kevin, but for me it just feels like a vacation from a vacation. Anyways, why the Philippines? Why now? As for my answer, my friend Anne is currently in the Philippines where she’s completing research for her master’s degree. So we flew to Manila to see her, and then we all three trekked our way down to El Nido, Palawan together, where she spent the weekend with us before heading back to Manila. We’re going to be in Palawan province until Monday, but then we’ll be heading back to Manila where we’ll hopefully get to see Anne one last time before adventuring our way back to Phnom Penh. I have much to write and say about Manila and El Nido, from our adventure to get here, to what it’s like being here and getting around. However, my Dropbox access is hampered by my internet situation, so my photo access is limited. 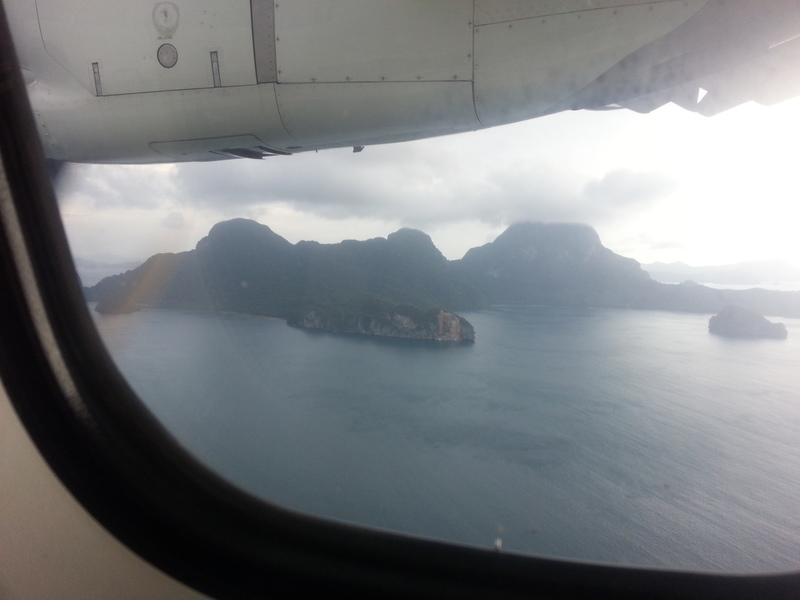 Here are a couple of photos from our flight to El Nido. The second photo was taken at the tiny airport we flew into on a private jet. Craziness. Next Post Birthday surprises with old and new friends. It looks like you had a wonderful birthday. More info than we had before. And wow does Kevin make friends fast. lol It was very nice of his new friends to just plan a party for you. The people must be extremely nice there. The sceanry looks beautiful. It is humid? I think I have talked enough for now. Be safe.